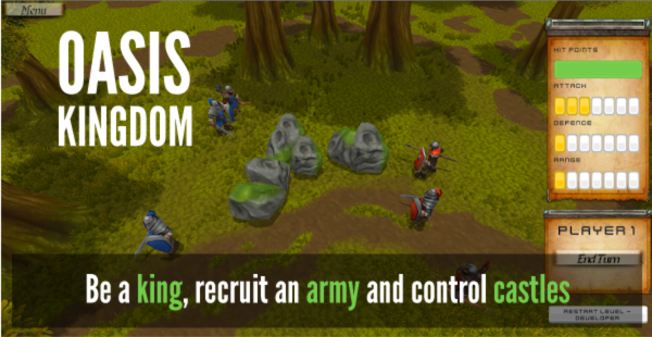 In the Oasis Kingdom, you can be a king, recruit an army and control castles. More than ten unique parts including forest, desert, volcano and more. Each section having multiple castles/buildings to fight over and conquer. There will be challenging battles that will require you to think and plan strategies for each of them. When a soldier dies it’s permanent while you can recruit more you need to be a good commander because your funds are limited. Conquer all the castles on a map to unlock the boss battle and move on to the next map. The Oasis Kingdom is a strategy game with an open map where the player can roam around, attack enemies and siege castles. Battles are turned based with the option to make them automatic. Each character will have different stats such as Hit points, attack range, attack factor, defense factor, movement points, speed, and action points (per turn). This stats will be different depending on the character, for example, a warrior with a shield will have high hit points and defense while a ranger will have a high range, high attack and low defense & hit points. Current controllable characters: warrior, ranger, horseman, and spear-warrior. There will be at least ten sections each with more than two conquerable buildings. The terrain will be different for each of them, on some rangers characters will have cover and the advantage while in others. In some instances, the terrain will be interactive and even while changing. In the forest, you will see medieval castles, while in the desert you can see the pyramids. In addition, there will be a secret (easter egg) section. The player will have the ability to pick a hero. These are customizable characters that will have the ability to level up and you will decide how to increase its attributes. In addition, they will have additional skills to power up your army.